These cool Christmas gifts for kids are sure to bring lots of laughs this holiday season. Fun Christmas gifts for kids, some say these unique plants are more like pets. Imagine the thrill of receiving TickleMe Plant Party favors for Christmas and growing real house plants that actually react when you tickle them! The leaves fold together and even the branches fall down when you tickle this amusing houseplant. 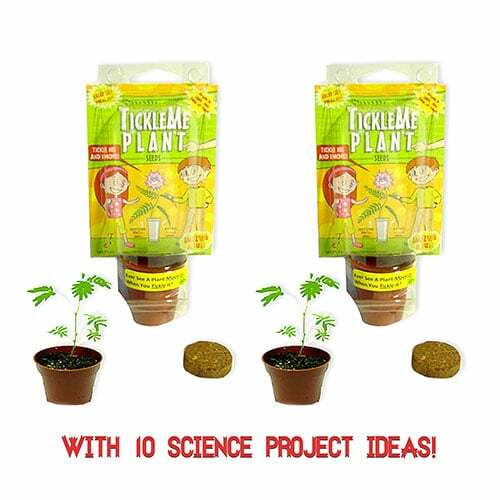 Recommended for kids 5+, the TickleMe Plant can be easily grown indoors year round for fun that never ends. The adult plant can even produce sparkling pink flowers that brighten up your holiday home. Great for any Christmas Party, give as a stocking stuffer or a unique educational Christmas gift for kids this holiday season.